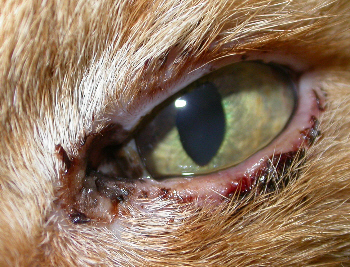 This elderly cat is presented with sore eyes which have been waxing and waning for a time. What might the underlying cause be and what treatment might you use? Here’s the other eye which isn’t as bad but shows a swollen hyperaemic mucocutaneous junction too. I’ve seen dogs like this with pemphigus and as the cat has been given a number of antibiotics I think that bacterial infection is unlikely to be the main cause. An ideal work-up would have included biopsy and immunohistology looking for autoantibody deposition but in and old cat such as this we have opted for systemic steroid (a short course of topical treatment hadn’t worked) hopefully to alleviate the chronic inflammation, whatever its underlying pathology. 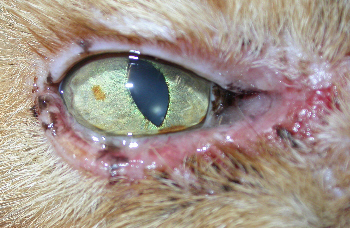 This entry was posted in Cases and tagged blepharitis, cat. Bookmark the permalink.